Hobbs and Shaw has officially wrapped principal photography. Jason Statham and producer Hiram Garcia shared some pretty epic photos to celebrate the occasion, adding to the previous BTS images that have been posted on social media since production started back at the beginning of September in England. Since then, Dwayne Johnson, Statham, and Garcia have shared how much fun that they’ve had working on the Fast and Furious spin-off. Though we have yet to see any official footage from the movie, Johnson, Statham, and Garcia have painted a pretty awesome picture of what fans can expect to see later this summer. The first Hobbs & Shaw photo features Jason Statham and Dwayne Johnson staring down a helicopter as it comes dangerously close to their heads. The two have their backs to the camera and appear to be in a casual conversation as if the helicopter is no big deal. It’s a pretty amazing image that Statham captioned with some kind words. You can read what Statham had to say below. Hobbs & Shaw producer Hiram Garcia has shared some pretty great pictures from the set over the last several weeks, including an intense picture of Dwayne Johnson and Roman Reigns together. However, this time around, he went for a more reflective shot. 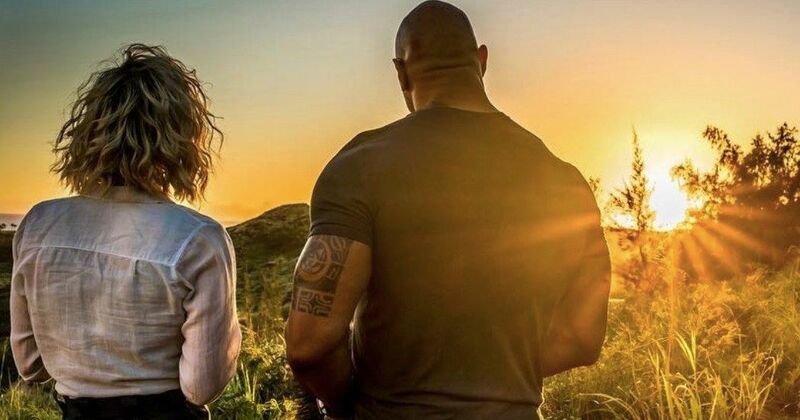 Dwayne Johnson and Vanessa Kirby are pictured with their backs to the camera looking off at what appears to be a beautiful Hawaiian sunset. Garcia had this to say about wrapping production. From the looks of things, and the way that Jason Statham and Dwayne Johnson interact, Hobbs & Shaw was a fun project to work on. Johnson is always throwing out positivity, but this particular project looks like it was the perfect decision for the future of the Fast and Furious franchise. Speaking of which, it has been seemingly confirmed that Johnson will not appear in Fast and Furious 9, which begins filming next month. From what Hiram Garcia says, he and Johnson are diving right into Jumanji 2. In addition to the Hobbs & Shaw behind-the-scenes pictures that Jason Statham and Hiram Garcia shared, Dwayne Johnson shared a video of himself in his portable gym that he had with him on the set. Each morning, around 5AM, the actor would hit it hard and he took a moment away from training to reveal his excitement for the movie along with his gratitude for the fans. While he says he had a blast making the Fast and Furious spin-off, he states that he cannot wait to get out and bring it to audiences. If Dwayne Johnson appears in Fast and Furious 9, it will more than likely only be for a cameo. However, since he is heading in to do Jumanji 2 and considering his previous words about the reasoning behind Hobbs & Shaw, it doesn’t look like he has any interest. With that being said, the spin-off is already set up to be a box office smash with Johnson, Jason Statham, Idris Elba, and Vanessa Kirby. You can check out the final set photos below, starting with Jason Statham’s Instagram account.